David Morgan gives us his advice for Silver Investing. David, author of Get the Skinny on Silver investing gives you part 1 of his “10 Rules for Silver Investing” in this video. David echoes and expands on some of the points I made in my recent interview with Paul Mladjenovic, author of Precious Metals Investing for Dummies. Although this is a video from 2011 it covers the basics. David talks about his recommendation on the types of physical silver the new silver investor should consider. First he suggests you invest in physical precious metals. This video covers the first 3 of David’s Rules. 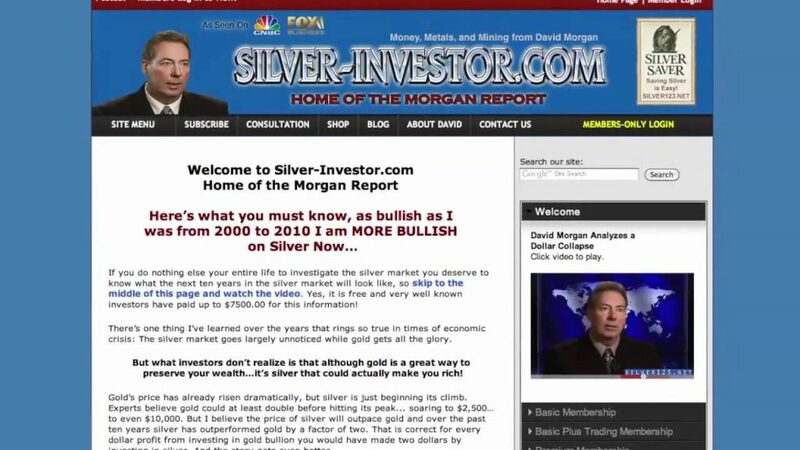 Make sure to watch part 2 for the rest of David Morgan’s 10 Rules For Silver Investing. The Silver Manifesto starts with a detailed examination of the monetary history of silver dating back over 5,000 years. The book changes focus from the monetary history of silver in the world to the history of silver in the United States. David examines the supply and demand aspects of silver. What are the forecasts for the coming years? Although silver usage in photography has faded out with the advent of digital photography many more industrial applications have been developed that have increased the industrial demand for silver. New applications in solar, biomedical and electronic devices are being developed almost every day. A discussion of silver would not be complete without a discussion of paper silver. Paper silver exists in a large multiple to the actual available physical silver. In many ways you can say it is just a creation of the markets and the banking system. With paper silver you are actually holding a paper claim to silver. Most holders of paper silver never require delivery of the physical silver that the paper represents. The huge disparity of paper silver and physical silver doesn’t really seem to bother the markets until there is a problem producing the silver needed for delivery. If your are not familiar with it David takes us on a journey through the banking system, particularly fractional reserve banking that truly seems like an Alice in Wonderland adventure for those who are not familiar with it. Email us here at www.preciousmetalsinvesting.com if there is a precious metals expert you would like me to interview or a question you want answered. Suggestions and comments are welcome. Listen to the Precious Metals Investing podcast. It can now be found on both iTunes and also Google Play Music for android users.